The West Hawaii Marine Mammal Response Network is always looking for volunteers. Network volunteers are involved in education, live animal responses and rehabilitation, dead animal recovery, event planning and fundraising. Led by Justin Viezbicke, of the Hawaiian Islands Humpback Whale National Marine Sanctuary, the network partners with state agencies, Coast Guard, University of Hawaii, and the sanctuary. Viezbicke talked about the network’s responsibilities at ReefTalk meeting Tuesday evening at NELHA. He said monk seals are a common sight along Kona’s shores, with one youngster frequenting beaches and even carports along Alii Drive. Network volunteers and other members of the public are urged to call in if they spot monk seals, so Viezbicke can track their movements and monitor their health. Viezbicke said he is most interested to learn of injured animals and shared one success story. In June 2009, a seal was spotted on Big Island shores trailing a fishing line. After a week of searching, rescuers nabbed the critter, X-rayed it and discovered the fishing line was attached to a hook the seal had swallowed. A quick trip to Oahu, where veterinarians were able to remove the hook, and the seal was back in Big Island waters within a week. 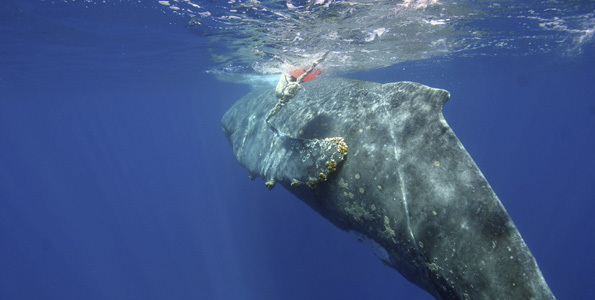 Viezbicke told similar tales of humpback whales, turtles and dolphins entangled in fishing line and gear. Not all of the stories have happy endings. Ropes that tightly bound and dragging that much weight “can literally cut a whale.” Rescuers saw skin problems along its back, which often is the first sign of declining health. Efforts off Kawaihae and Oahu failed to free the whale and it still is out there tangled up. Viezbicke said he can always use more people in the network, which meets at his NELHA office at 6 p.m. the first Tuesday of every month. For further information or to volunteer, contact Viezbicke at 327-0765 or justin.p.viezbicke@hawaii.gov. Those who see an entangled or distressed marine mammal should immediately report it by calling Viezbicke or the NOAA Pacific Islands Region Marine Mammal Stranding & Entanglement Hotline at (888) 256-9840.